Traditionally January isn't the best month for new game releases, but Nintendo of Europe is bucking that trend by releasing Boom Street — known as Fortune Street in North America — on 6th January. The party game will miss the lucrative Christmas and New Year party season but Nintendo is still hoping its cast of characters from the worlds of Super Mario and Dragon Quest and online multiplayer will win over the family market. North America, you get the game a month early: it's yours to buy from 5th December. 15th November 2011 – Be the financial master of your friends and family when the family-friendly interactive board game Boom Street™ comes to Wii™ on 6th January. Boom Street asks you to navigate one of several different themed boards, purchasing property as you go while charging opponents for landing on them. Each of the boards are themed on favourite Mario and Dragon Quest locations, with fan-favourites such as Starship Mario from Super Mario Galaxy (Wii) and Alltrades Abbey from Dragon Quest both making an appearance. You can play as your own Mii™ character or also choose to play as one of over 20 playable characters from the Mario and Dragon Quest franchises, including Mario, Luigi, Bowser, Yoshi, Slime, Platypunk and Stella. If you’re a financial whizz or mad with your money there‘s fun to be had and money to be made on Boom Street, only on Wii from 6th January. Time is money, so what are you waiting for? You know that this game shall be released on Epiphany, right? First time I hear about this game. How did they end up having Mario and DQ characters in the same game? how long til protestors turn up and try to occupy Boom Street? @Late Developer is Square Enix. Yay! FINALLY I get a chance to play one of these games in English with my friends! I've been waiting years for them to bring one of these games outside of Japan. Boom Street? Does that mean something in Europe? Would have been nice if SE localized the FF and DQ crossover version on PSP. 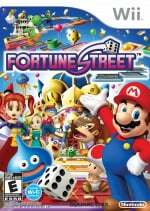 And the DS version of Fortune Street. I'll take it either way. Positively sure NoA was behind localizing this because they really want to push the DQ games' popularity here. A nice-looking party game with a fresh idea here in the 'states. I wonder why they renamed it, I think it's American name is better. @11, @14: It's referring to the "boom and bust" of economic cycles. Boom = sudden large economic growth (and bust is the opposite, such as the recession we're all currently in). Officially the first time I've heard of this game. But, if it's a money management board game with Monopoly flavours... as the Dragon's Den would say, "I'm in." 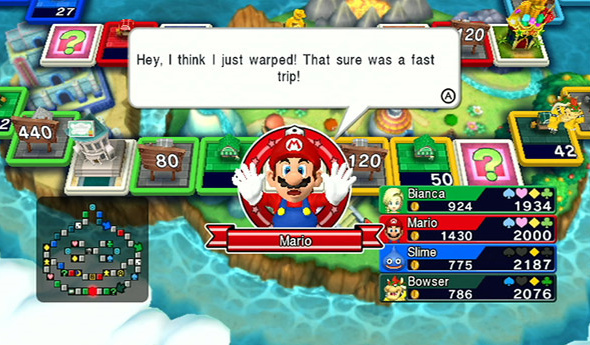 Still strange to see Mario "talk". The series in big in Japan, I know, but I'm not really up for it. They should've bundled this with Mario Party 9 imho. When's that out? I want it because of Bianca. I wish it was called Boom Street here, then the entire time playing it I could go "Who's the Boom Queen? I'm the Boom Queen!" Boom Party? Sounds more like a party game featuring Bomberman. Sounds fun, looks fun! I might get this! I believe I read this is a companion to the Japan-only game, Itadaki Street DS (for the DS, duh! ), which also featured Mario and Dragon Quest characters. There's a fun fact for you! Nintendo can call it however many different names they want, it's still Itadaki Street. so... this is what? Nintendo and SE characters meet monopoly? That's what I've been wondering. I expected a holiday release, but no mention has been made since E3. I'm starting to wonder if they might be moving MP9 onto the Wii U as a launch title . . . it would make a lot of sense. Then again, we never got a great Mario Party game out of the Wii, so I hope they don't bypass it. @wariowoods That being said, a lot of the Mario Party games in recent times haven't been that good. Though Hudson (WHERE IS MY 3DS BOMBERMAN ADVENTURE GAME KONAMI!) isn't really around anymore so perhaps an in-house version would be better. What's with European Wii games and strange names like "Boom Street" and "Animal Crossing: Let's Go to the City". I can understand "Boom Street". Maybe it's because of the saying "business is booming". But what's with "Animal Crossing: Let's Go to the City".